How one Roman Emperor ordered genocide against the Scottish people; Simon Elliott's appearance on the History Hit podcast with Dan Snow. Ancient Roman 'hand of god' discovered near Hadrian's Wall sheds light on biggest combat operations ever in UK – an article by David Keys for Independent.co.uk, with comments by Dr Simon Elliott. You'll be £19.99 closer to your next £10.00 credit when you purchase Septimius Severus in Scotland. What's this? Order within the next 3 hours, 6 minutes to get your order processed the next working day! Since 1975 much new archaeological evidence has come to light to illuminate the immense undertaking of Septimius Severus’ campaigns in Scotland, allowing for the first time the true story of this savage invasion to be told. In the early 3rd century Severus, the ageing Roman emperor, launched an immense ‘shock and awe’ assault on Scotland that was so savage it resulted in eighty years of peace at Rome’s most troublesome border. The book shows how his force of 50,000 troops, supported by the fleet, hacked their way through the Maeatae around the former Antonine Wall and then pressed on into Caledonian territory up to the Moray Firth. Severus was the first of the great reforming emperors of the Roman military, and his reforms are explained in the context of how he concentrated power around the imperial throne. There is also an in-depth look at the political, economic and social developments that occurred in the Province. This book is aimed at all who have an interest in both military and Roman history. It will particularly appeal to those who are keen to learn more about the narrative of Rome’s military presence in Britain, and especially the great campaigns of which Severus’ assault on Scotland is the best example. Elliott has a great grasp of military and architectural detail but despite the vast amount of information this is an easy read that is complemented by the use of illustrations. ★★★★★ Septimius Severus in Scotland is a short but compelling analysis of the Emperor’s two campaigns in what is now Scotland in AD 209 and 210. The contemporary sources are few but the author, Dr Simon Elliott, brings to bear his knowledge as an expert of Roman military history and as an archaeologist to portray a more complete account of the campaigns than hitherto has existed. Read the complete review online here. 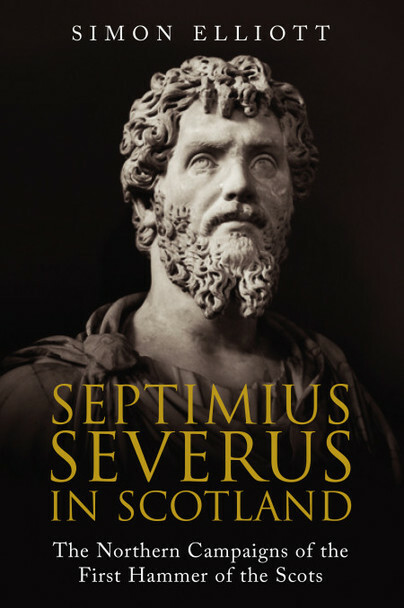 “Septimius Severus in Scotland” is a book I would recommend to anyone with an interest not only in Roman history, but history in general, and would complement any historic literary collection. Simon Elliott is an archaeologist, historian and leading aerospace journalist, and former editor at both Jane’s Defence Weekly and Flight International. He has just completed his PhD in Archaeology at Kent University and has an MA in Archaeology from UCL and an MA in War Studies from KCL. He is an Honorary Research Fellow at Kent University. His research has been published in History Today, RUSI Journal, Military History Monthly and British Archaeology, and he is the author of Sea Eagles to Empire: The Classis Britannica and the Battles for Britain (shortlisted for the Military History Monthly Book of the Year Award). Simon lectures widely to local history societies and archaeological groups. He is co-Director of the Roman villa excavation at Teston and is a council member of the Council for British Archaeology’s South East region.